Most, if not all, pages on this website have focused on the historical reasons as to why Japan’s claim to Dokdo is unacceptable. This page focuses on the geographic reality of the Dokdo – Takeshima region. Korea’s Dokdo Island is sometimes referred to as Liancourt Rocks. On this page the reader will get an clear picture of the geographical features of the East Sea (Sea of Japan). The maps included show the distances of nearest Korean and Japanese islands and landfalls to clearly illustrate why Japan’s 1905 incorporation was seriously flawed. 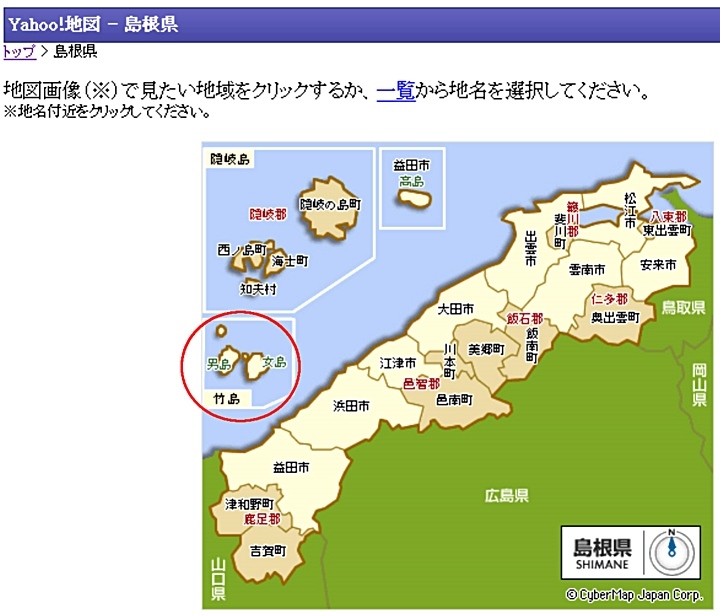 Also these maps will show how unreasonable Japan’s MOFA and Shimane Prefecture are in their push to essentially re-annex Dokdo Island. 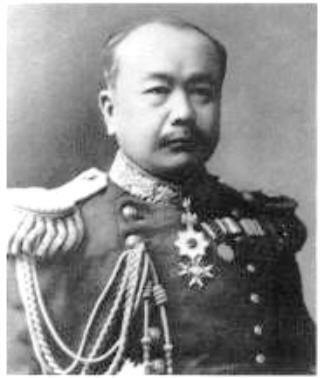 During the Russo~Japanese War of 1904~1905 the Japanese Navy’s Hydrographic Director Kimotsuki Kenko examined a map of the Dokdo Takeshima region and determined Liancourt Rocks were closer to Japan’s mainland than Korea. 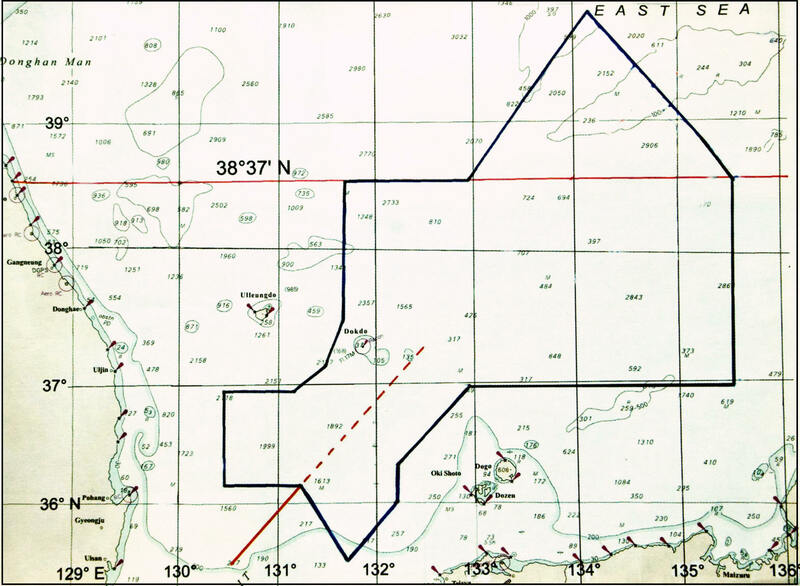 From this simple baseline distance comparison Japan unilaterally decided they should annex the islets. Absolutely no consideration was given to Dokdo’s most proximate island, Chosun’s Ulleungdo. In addition, because Japan had already militarily occupied the Korean peninsula no international boundary was drawn between Japan-Korea after the 1905 incorporation of Liancourt Rocks. Japan’s past reasoning for annexing Dokdo Takeshima cannot be considered as an equitable premise in solving this territorial dispute in today’s modern world. To the right is a picture of Kimotsuki Kenko. A career naval man, he was the director of the Japanese Imperial Navy’s Hydrographic Dept. This oganization was instrumental in providing logistics for the Japanese Navy during the Russo Japanese War when Dokdo was annexed. Is Today’s Current Japan – Korea Boundary Unfair ? As it stands today, the Republic of Korea controls and administers over Dokdo Island. 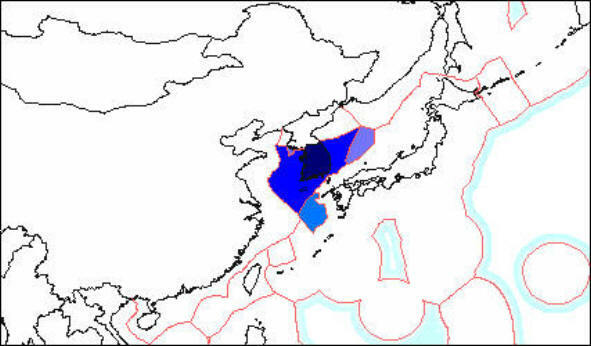 The waters around the islands are a joint provisional area (outlined in blue) however Korea maintains a 12 nautical mile limit around the islets where Japanese vessels are not permitted to enter. Korea possibly maintains this boundary to illustrate fishing agreements should not be mistaken as a degradation of Korean soveriegnty over Dokdo. This could also be to prevent radical right wing civilians from attempting to perform displays of sovereignty (flag planting etc) on the islets. 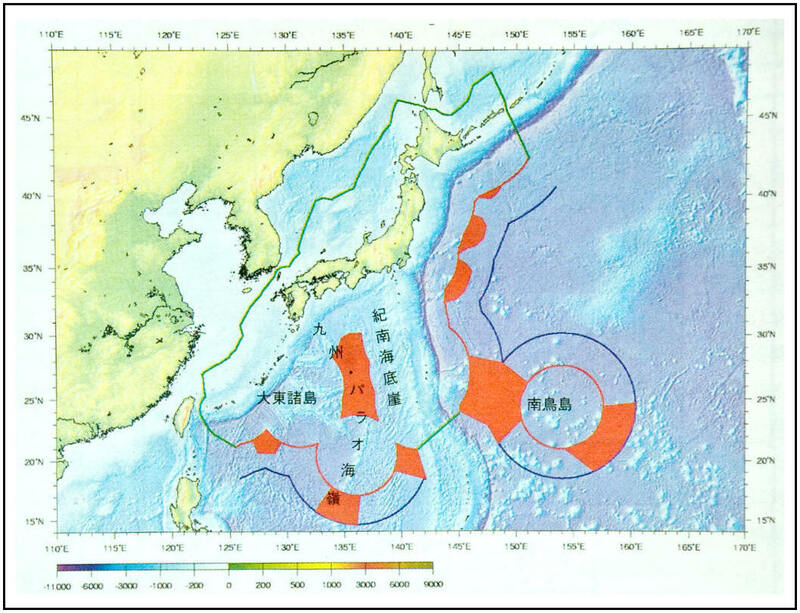 This map shows the current joint provisional fishing area established by Korea and Japan in 1999. Korea does not allow Japanese vessels to approach within a 12 nautical mile zone around Dokdo Island. Japan’s MOFA and Shimane Prefecture maintain this current boundary is unfair. Japan often stresses Shimane Prefecture (Japan’s poorest prefecture) “..suffers at the expense of Korea’s greed..” because Korea’s President Rhee unilaterally imposed the Peace Line (Rhee Line) after WWII. But how bad was the Rhee Line? Was it a draconian land grab as Japan’s MOFA asserts? The map below is the Japan Korean border as it stands. 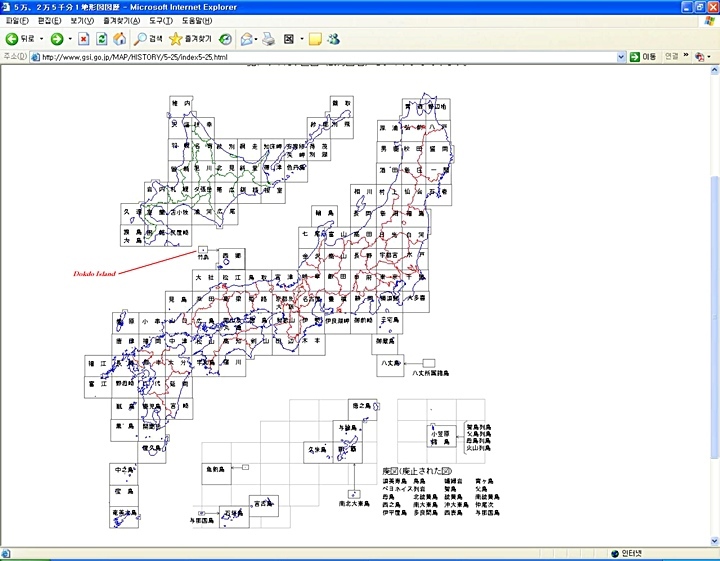 Included are the distances to Japanese and Korean landfalls and islands. We can immediately see, the current border is in reality quite fair. Korea’s coastal fishing communities have can access about 235 kms and Korea’s Ulleungdo Island’s limit extends approximately 110 kms. Japan’s coastal areas have a little less ocean to fish at around 195 kms and Japan’s Oki Islands still can access around 140kms to the Japan Korea boundary. Based on the distances shown below, the present day Japanese and Korean limits divide available ocean resources as equally as could be expected. Japan currently has the seventh largest EEZ in the world totalling 4,479,388 square kms. However only 1,793,055 square kms of this actually comes from Japan’s proximal adjacent waters. The remaining 2,686,333 square kms consist of EEZs generated from Japan’s outlying islands. Marcus Island, The Ogasawaras, and the Rykyus with continental shelves enable Japan to expand her territorial size about more than three times. The Republic of Korea’s EEZ accounts for a total of 300,851 square kms approximately one-fifteenth the size of Japan’s. The comparative images above show Japan’s immense 4,500,000 sq km EEZ. The pink areas are disputed, note Japan currently has disputes with all her neighbours. Japan’s EEZ is the worlds seventh largest and about 2,600,000 sq kms of her EEZ is generated from small outlying islands. 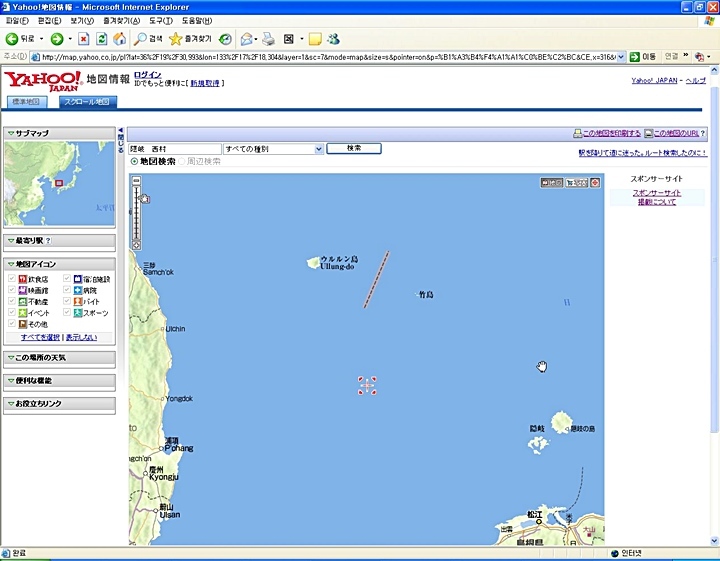 The map above right shows Korea’s EEZ. Korea’s total 300,000 sq km EEZ is smaller than the 400,000 sq kms Japan claims around tiny Marcus Island. Japan’s has a large area of territorial water as a result of her colonial, expansionist era. More recently Japan’s ability to acquire so much territory due to of her aggressive policies regarding EEZ. Japan has maintained all islands no matter how small or large or inhabitable can creat Exclusive Economic Zones. Because of this, Japan has territorial disputes with all of her Asian neighbours, Russia, China, Taiwan and South Korea. The maps above show Japan’s EEZ with outlying islands included. The map above left shows distant Marcus Island claimed by Japan around 1898. The green line incorrectly shows Japan’s border extending into areas currently disputed by Japan’s neighbours. The island is surrounded by an exclusive economic zone of about 400,000 square kilometers, but covers an area of only a bedroom at high tide. 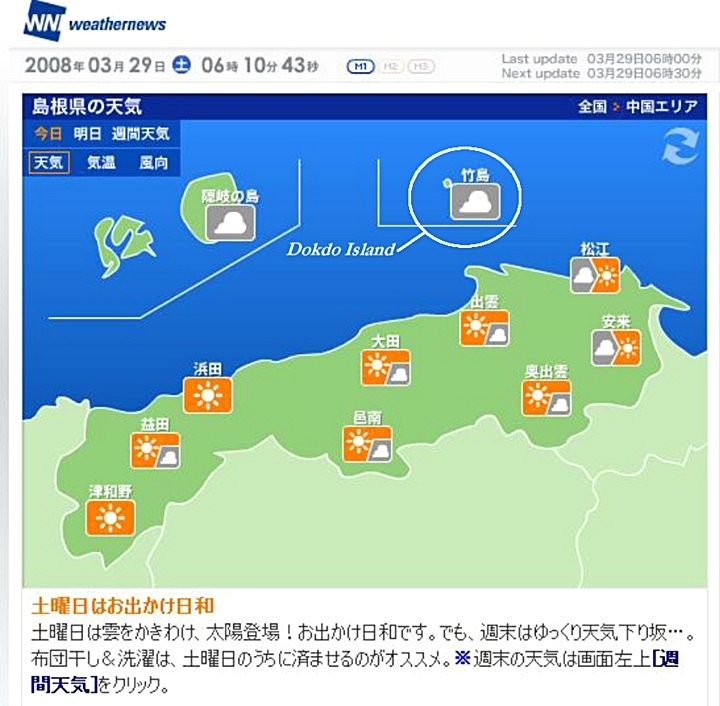 Typhoons and global warming are constant threats to Okinotori’s existence. A few decades ago, there were about five or six visible protrusions, but by 1989, only two were visible. The Okinotorshima’s are a classic example of Japan’s aggressive posture towards expanding her territorial limits. Okinotorishima (沖ノ鳥島) is an atoll, which in English has multiple designations. 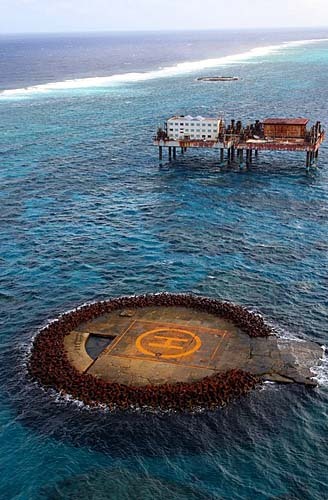 In order to prevent the island from submersion caused by erosion and maintain the claim to the EEZ, the Japanese government launched an embankment building project in 1987, and Higashikojima and Kitakojima were surrounded by concrete. Furthermore, the Nippon Foundation has drawn plans to build a lighthouse and increase the size of the reef by breeding microorganisms known as foraminifera. 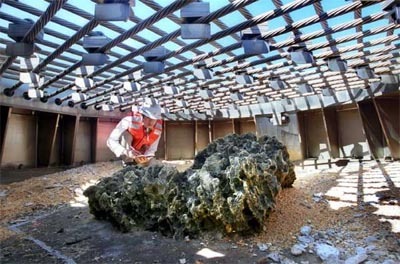 Japan‘s Coast Guard wanted the lighthouse partly to counter China’s claim that Okinotorishima is merely a rock reef. Currently, Japan carries out research and observation of the area, as well as repair work on the embankment. In the picture above left, A 50 million dollar titanium net hangs over the few precious rocks that “allow” the Japanese to claim 400,000 sq kms of adjacent ocean. Jon Van Dyke, a law professor, has suggested that the situation is similar to the failed British attempt to claim an EEZ around Rockall, an uninhabited granite outcropping in the Atlantic Ocean. The UK eventually dropped its claim in the 1990s when other countries objected. Dr. Dyke has further asserted that “It is impossible to make a plausible claim that Okinotori should be able to generate a 200 [nautical]-mile zone…” Not surprisingly, Tadao Kuribayashi, another law professor, disagrees, arguing in part that rocks and reefs differ in composition and structure, and that the intent of the provision was geared toward the former. More recently the Japanese government and right wing lobbyists have been misleading the international community by intentionally producing and circulating maps that show Dokdo Takeshima as Japanese territory. 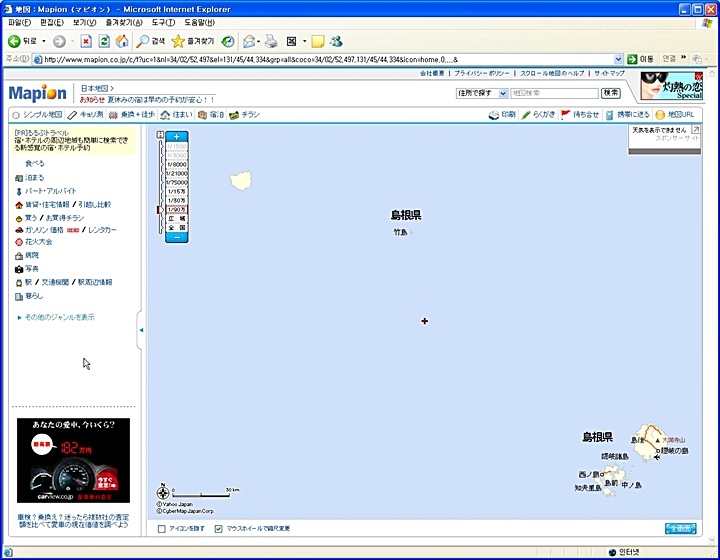 In December of 2007, the Japanese government released maps showing Liancourt Rocks as part of Shimane Prefecture. Shockingly, Yahoo.co.jp’s East Sea (Sea of Japan) map currently shows a distinct red border between Ulleungdo and Dokdo. Of course Dokdo Takeshima Island is internationally recognized as part of South Korea. There is nothing scandalous about Japanese showing the sovereignty of Dokdo Takeshima is disputed. However, the maps below are quite inexcusable and show Japan’s MOFA is not sincere in her diplomatic efforts but rather is trying to provoke the Korean government and mislead the international community. These maps also illustrate the Japanese government is systematically backing these political lobbying efforts from the private business sector. 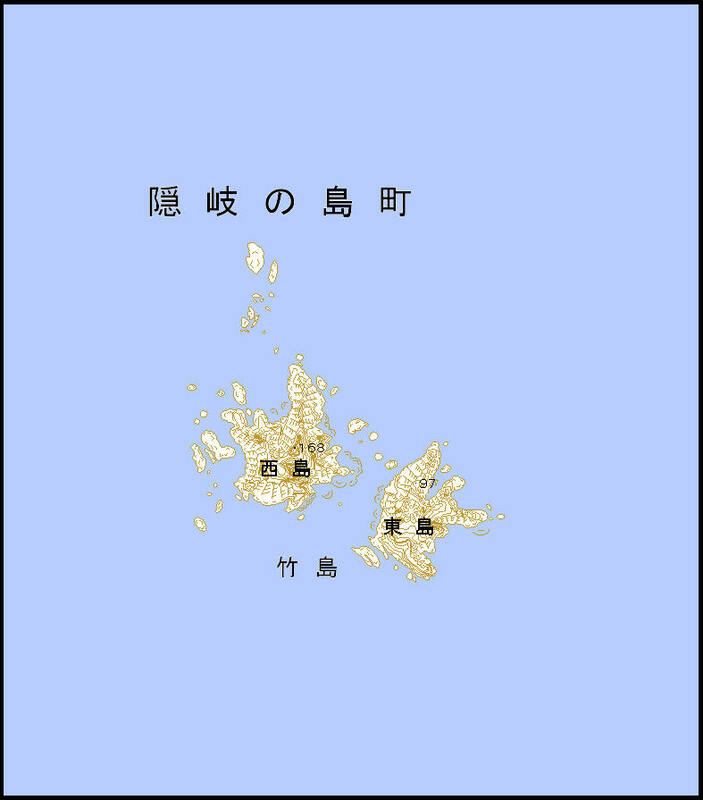 The map shown above by Japan’s National Geographical Survey Institute shows Dokdo island as appended to Shimane Prefecture Oki Islands which is of course not true. Japan’s MOFA is employing other government agencies to deliberately mislead their own public as well as the international community. Please click the map twice for a very large image. 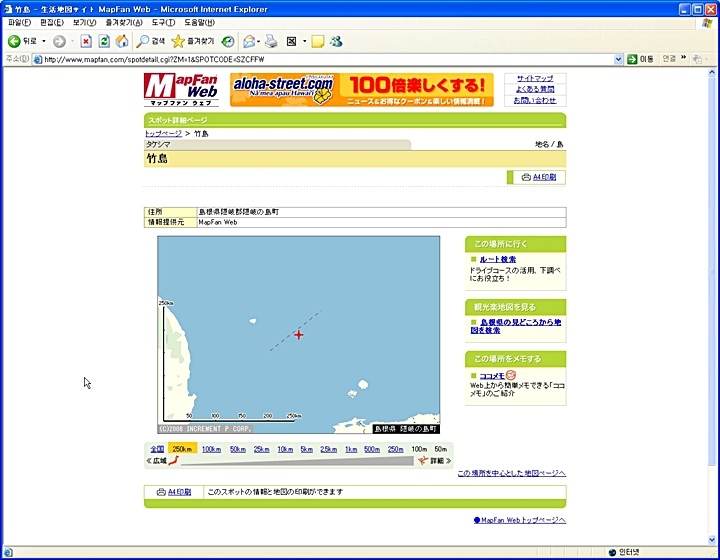 The map seen on Yahoo Japan’s map website shows an equidistant line drawn between Korea’s Ulleungdo and Dokdo Islands. This map seems in line with Japan’s policy regarding tiny unihabited islands as EEZs. If Japan were to again have sovereignty over Dokdo Takeshima she would be bound to follow her past policy of tiny islands equal EEZs or face weakening her claim over the Okinotorishimas. This could mean an equidistant line between Ulleungdo and Dokdo. 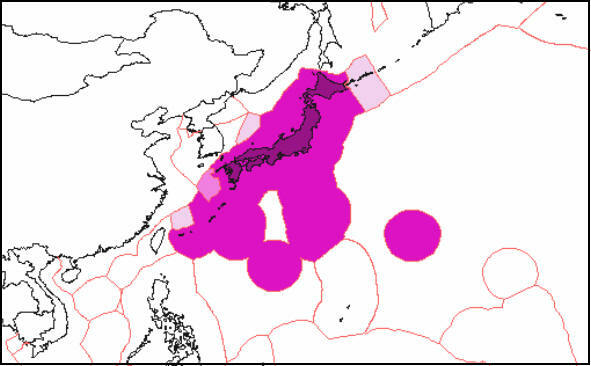 The map below shows the distances between nearest Japanese and Korean landfalls and islands if such a boundary were drawn. Immediately it’s clear the borderline between Japan and Korea would be anything but fair. 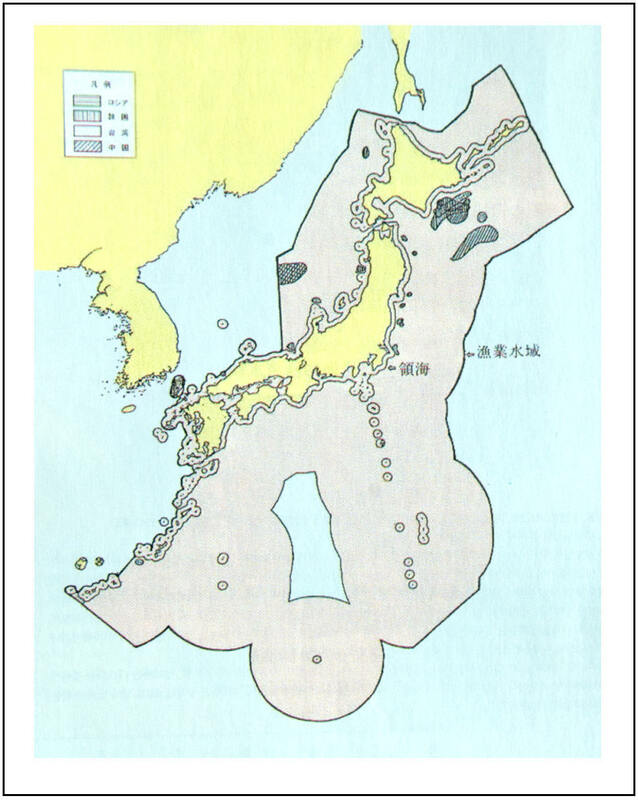 Even if Japan were not to declare Dokdo Takeshima an EEZ, she would of course put some boundary around the islets. This could mean a 12 nautical mile line around Dokdo Takeshima such as Korea enforces to this day. Again however, the boundary would again be on Korea’s Ulleungdo Island’s front door. Even if Japan were to impose a modest border of 12 nautical miles around Dokdo Takeshima, the results are hardly equitable. Ulleungdo Island would be bound to only 65kms of ocean while Japan’s Oki Islands could gain 185 kms of marine resources. The map aobve shows a 12 nautical mile boundary around Dokdo if Japan were ever to have sovereignty over Dokdo. Even with this small limit in place the result cannot be considered an acceptable alternative. Another option that has been proposed is an equidistant line between both Korea’s Ulleungdo Island and Japan’s Oki Island be drawn. Both of these islands are large, inhabitable and capable of generating EEZs under United Nations Convention on the Law of the Sea. Using this modern law for drawing the boundary clearly places Dokdo within Korea’s territory. Generally, any point within an overlapping area defaults to the most proximate state Though based on modern international law, Japan could stand to be the big loser if this border ever became a reality. The page above proves two facts. First Japan’s baseline distance logic for annexing Liancourt Rocks in 1905 was seriously flawed. Under United Nations Convention on the Law of the Sea, more even-handed methods are used to determine territorial ownership of islands and international boundaries. Secondly granting Japan sovereignty would cause the boundary of Japan and Korea to encroach on Korea’s Ulleungdo Island. This would place a great strain on Ulleungdo’s fishing communities of Jeodong, Dodong and Hyeonpo not to mention eliminate Dokdo’s thriving tourism industry Korean’s have worked so hard to develop over the past years. It’s not surprising former colonial nations such as Britiain, France and America have some of the largest EEZ in the world. The islands these nations claimed during the 19th Century still generate huge EEZs for these countries which under “international law” allows them to harvest a wealth of resources from these territories. However, it is one thing to maintain sovereignty over these past land grabs but yet another to justify re-annexing them in modern world. Other developed nations have let go of the colonial era yet Japan unabashedly tries to expand her territory toward Korea as she had centuries before.